Somebody on Twitter has been screwing with Hillary voters' heads. Earlier this week, a series of tweets emerged alleging that voters could save time by texting their choice in. 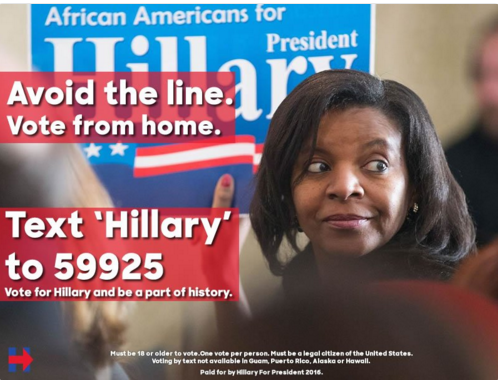 The whole thing was framed in a very Clinton-centric light, saying you could text her name to a short number in lieu of actually hoofing it to the polling station. That, in and of itself, should have been enough of a red flag for many, as any information about how to vote is typically presented impartially. Sure enough, not long after the tweets started going out, people were reporting them in, but it wasn't until BuzzFeed news got hold of it and contacted Jack Dorsey directly that Twitter actually did something about it. That something about it ended up being a full removal of all the tweets, and a disclaimer warning people that if they did try and vote via text, for Clinton or otherwise, nothing would happen. One account has been banned, but the tweets had emanated from several, so there may still be work to do yet before the tide is stemmed. The account which was suspended belonged to a self-proclaimed 'hero of the alt-right' who has had previous accounts blocked for similar reasons. Cannily, the Clinton campaign have actually taken advantage of the hoax. They drafted in iVisionmobile, who took over the number advertised so that any unwitting Clintonites who try it will be told they've been had, and then provided with a number for the actual text subscription campaign. Well played, Hill-dog. This is another chapter in the long, sad tale of unpleasantness which manages to slip through the cracks of Twitter, but it seems like no permanent damage has been done this time. It shouldn't be any kind of praising statement that they actually sorted this out, but by comparison to previous incidents, they did well to act as quickly as they did.